Emergency Medical Technicians (EMTs) is a term used to describe a provider of emergency medical services. 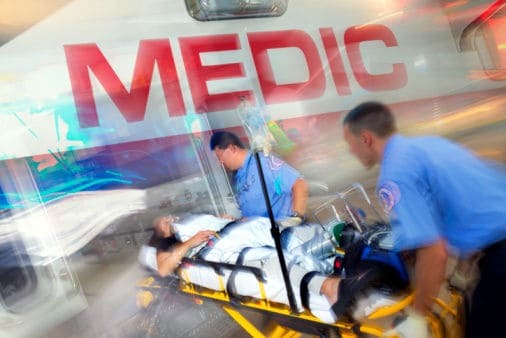 In general, EMTs respond to emergencies and perform a limited set of medical procedures. In addition, EMTs are responsible for transporting patients to hospitals. EMTs have a rigourous required training curriculum and each individual state sets their own standards of certification. The training standards, however, must meet a minimum set of requirements administered by the National Highway Traffic Safety Administration (NHTSA). The National Registry of Emergency Medical Technicians (NREMT) is a non-government organization that administers certification exams based on the NHTSA guidelines. The National Registry of Emergency Medical Technicians (NREMT) is a private certifying organization. Being certified by the NREMT is different than being licensed as an EMT by your state. Your state grants you an EMT license but they probably require you to be certified by the NREMT. Currently, 46 states rely on the NREMT certification exams to assess a candidate and their readiness at one or more EMT certification level. The NREMT’s purpose is to independently identify EMT candidates who have successfully completed the NREMT’s educational requirements and demonstrated their EMT skills in mandated tests and exams. The NREMT also maintains a registry of adverse licensure actions and criminal convictions. First Responder – Entry level EMS services. EMT-Basic (EMT-B) – This certification level provides basic life support, including non-invasive procedures such as bleeding control and splinting. All NREMT test questions are multiple choice. Each EMT test question has four potential answers. There is only one best answer although each of the potential answers has some level of plausibility (meaning that each incorrect answer is somewhat believable). All NREMT tests are computer-based and are administered in a “computer-adaptive testing” (CAT) format. The CAT format modifies or adapts the difficulty of the questions based on how a student answers the questions. First, an average level question is given, and then more challenging questions are given if the first question is answered correctly, or easier questions are given is the first question is missed. Students report that the number of questions that they are presented with varies greatly. Many students only see approximately 70 questions, while other students report that 130 or more questions are presented. The intent of the CAT approach is to adapt the questions based on the user’s aptitude. With the CAT approach, you are not allowed to go back and change answers to previous questions, and you must answer each question to proceed. The results of your NREMT tests are made available to you within 24 to 48 hours of your EMT examination. You can check your EMT test results at the NREMT website. If you fail any of the NREMT certification exams, you can retake the exam after 15 days.